Instead of paint, imagine having a palette of all kinds of stuff. Think Rauschenberg. Think art play. 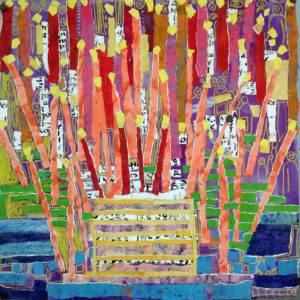 Students will learn the process of building collages by using found paper and other objects, as well as preparing papers in a variety of ways, including some printmaking, to combining them with other materials on a surface. Paper, cardboard, ribbons, paints and miscellaneous materials will combine to form titillating surfaces for compositions. Students should bring acrylic paints and other color mediums they have, such as pastels, crayons, markers, charcoal. Materials fee will cover paper and adhesives. After the first class, students will bring in a variety of materials that will be discussed. This is a gritty, intensively tactile and fun class.